Round two of the search to find the best breakfast in Memphis is underway. If this were March Madness, Round Two would be the Elite 8. This week, downtown’s Blue Plate Cafe faces off against Midtown’s own Barksdale Restaurant. The competition was fair – each restaurant was graded by the round two criteria (orange juice, service, atmosphere, meal, bathrooms, and price). And in the interest of total fairness, I even went a step further this week and made sure my dining companions had the same name. Food: Originally, I ordered the strawberry waffle, but Blue Plate’s waffle iron was busted. Most of the waffles are also available as pancakes, so choosing something else was easy. The stack of three fluffy pancakes were topped with fresh strawberries and several huge mountains of whipped cream. There was no need for syrup. Honestly, I could have done with a few more strawberries and a bit less whipped cream. The pancakes tasted good, and the whipped cream didn’t make them too soggy or too sweet. Be warned, though, that this is a lot of food. I made it about halfway through mine before I had to admit defeat. The Order: Orange juice, coffee, a Greek omelet with a biscuit. It came with a choice of hash browns or toast, but I opted out. 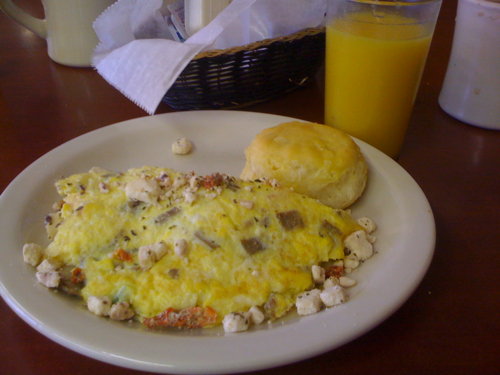 Greek Omelet, Barksdale Restaurant, Memphis, Tenn.
Food: I ordered the Greek omelet, which was filled with feta cheese, mushrooms, green peppers, onions and tomatoes. All of the vegetables were fresh and not over-cooked (the peppers had a noticeable crunch). The eggs were thick and fluffy, and the slightly seasoned feta added a nice kick. The omelet came with two salty, light biscuits. Barksdale’s biscuits are kind of a crapshoot – today, they were almost perfect, but sometimes, they’re dense, too doughy, and a bit overcooked. Atmosphere: Though the Barksdale Restaurant is packed on the weekends with families and Midtown hipsters that stayed out too late the night before, during the week, it’s a fairly relaxed place. There were a few older men, a big, well-behaved group of friends, and a couple or two. Price: Breakfast for two was $18 before tip, which is totally fair. (7 points). It looks like Blue Plate has just barely edged the Barksdale out of the competition. Blue Plate will face off against the winner of the Bardog / Miss Polly’s match up. This was the clash of the juggernauts. Booooo! Barksdales for LIFE! Haha. I always feel like Blue Plate is corporate for some reason. It’s like I’m getting the pre-approved mid-America breakfast dining experience, not something homemade and local. I think you should include Quetzal in one of the brackets! They have a great breakfast and awesome atmosphere. Deserve a chance against other breakfast places in memphis. Oh well, it’s all subjective, isn’t it? You know, everyone has an opinion… Mine says that a bad day at Bob’s Barksdale Cafe is miles better than the best day at blueplate. Regardless, it’s been fun following your adventure! So I’m wondering what a “decent-sized pint glass” is? A pint is a pint, right? The only difference is whether it’s a British pint or an American one. I’m with Ryan. Boooooo! Blue Plate. I was really pulling for Barksdale on this one. I’ve only been to Blue Plate once and totally hated it. Maybe I should give them another shot.